Tory O’Kane Lamberth has been stealing slices of pie and bits of bacon ever since she could crawl. At home, she specializes in leftovers, but in the workplace Tory specializes in development of small businesses. Her background is in branding and marketing. She spent three years building the brand for a dark fiber telecommunications company, Lexent Metro Connect (now Lightower Fiber Networks) and most recently Metro Network Services. She holds a BA from Boston College and an MBA from Dartmouth. Sarah Meskin is a native New Yorker living and designing in Alexandria, Virginia. She provides print, book, and web design services to businesses of all sizes. When not designing she can probably be found knitting or cooking. Mal Jones, an Alexandria, Virginia based artist, creates websites and provides other design services for small to medium sized companies. He loves working with local business owners to bring their work online. Patricia Perez, originally from San Salvador, El Salvador, came to Washington DC in 1991 and has thrived here ever since. Patricia has grown to love her city she now calls home. She learned to cook from her mother who was a chef and enjoys trying out new recipes and making foods from her homeland for her friends and family. One of her favorites… pupusas! 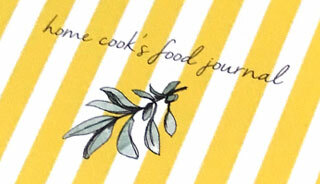 Shop for our Home Cook’s Food Journal and more. Sign up for news, updates, and more!